How much will it be used? A path from the street to your front door will need to stand up to more traffic than one between flowerbeds in the back garden. Do you have a path around the perimeter of your garden that is rarely used because it’s quicker to walk across the lawn? Lay paths, or stepping-stones, where people are actually going to use them. Does it complement the style of your house and garden? Straight concrete or slab paths suit formal gardens but look out of place in a woodland garden. Crazy paving can add quaintness to a cottage, but seems strange leading up to a modern house. When choosing bricks, slabs or gravel look for colours that will blend well with adjoining buildings and walls. Think about how the path will fit into the garden. Will it be on the same level as the surrounding ground or slightly raised? Will it need to include steps? Do you want an informal look with plants spreading over the edges of the path? Or clearly defined, perhaps with a contrasting edging? Will it lead to a focal point of the garden? 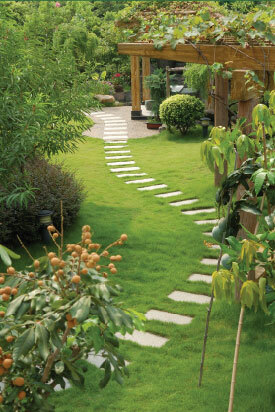 Garden paths are not just for walking on! They also guide the eyes. When viewed from the house does the path only draw attention to the compost heap? Perhaps you could curve the path towards something more interesting, or make a new focal point in front of the compost. When you’ve spent time and thought on designing the perfect paths for your garden it makes sense to construct them from good quality materials and lay them properly with adequate foundations so they will last for years. If this seems like too much hard work, or you need some advice on how to do the job properly, consult a local professional landscape gardener. Find one who is willing to visit and give you a free, no obligation quote either to do the work for you, or to supply the materials only if you want to do it yourself.